Taipei, Taiwan (5 October 2017) – G.SKILL International Enterprise Co., Ltd., the world’s leading manufacturer of extreme performance memory and gaming peripherals, is thrilled to announce new Trident Z and Trident Z RGB specifications for latest 8th Gen Intel® Core™ processors built on the Coffee Lake microarchitecture and Z370 chipset motherboards, manufactured with ultra-high performance Samsung B-die DDR4 ICs. With every new platform launch, G.SKILL aims to maximize performance with higher memory specifications. This time paired with the new 8th Gen Intel® Core™ processors and Z370 chipset, the Trident Z RGB memory is pushed to a blistering DDR4-4000MHz CL18-19-19-39 32GB (4x8GB) at 1.35V. The image below shows the new RGB kit stress tested on the ASUS ROG MAXIMUS X HERO (WI-FI AC) motherboard and an Intel® Core™ i5-8600K processor. 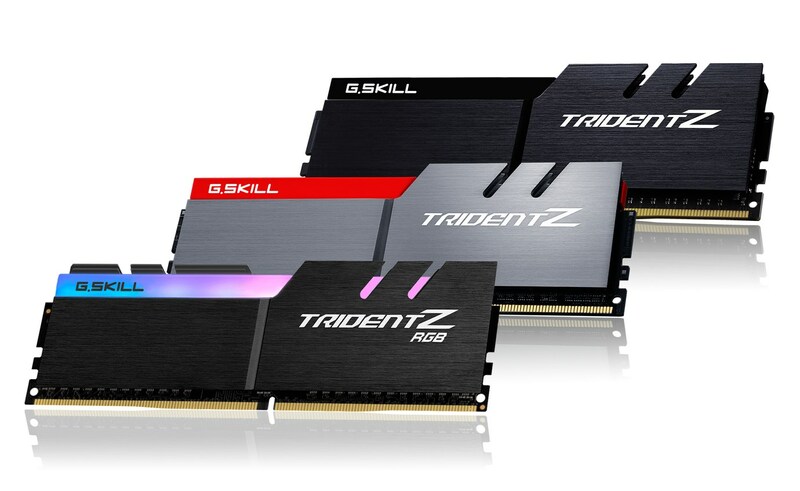 In addition to the new RGB memory specification, G.SKILL is also releasing an ultra-fast Trident Z memory kit for pure performance seekers. 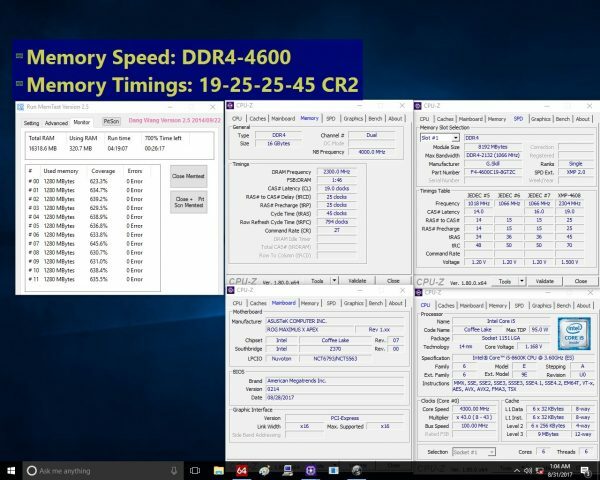 The new kit runs at DDR4-4600MHz CL19-25-25-45 16GB (2x8GB) at 1.5V. 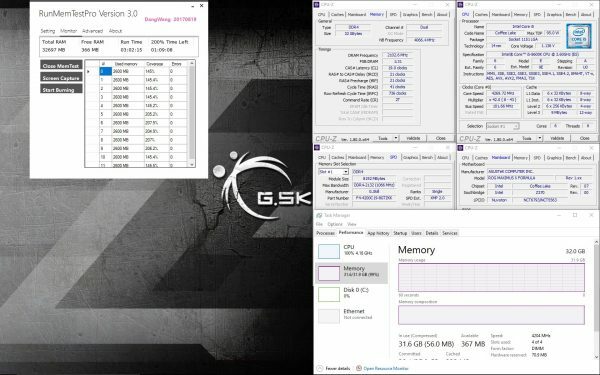 The following screenshot shows the memory kit under validation test on ASUS ROG MAXIMUS X APEX motherboard and an Intel® Core™ i5-8600K processor. 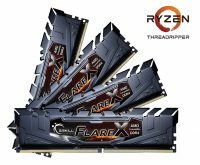 Perfect for users with light workstations and content creation PCs, without the need to sacrifice memory frequency or capacity, G.SKILL releases a new DDR4-4200MHz CL19-21-21-41 32GB (4x8GB) at 1.4V memory kit. 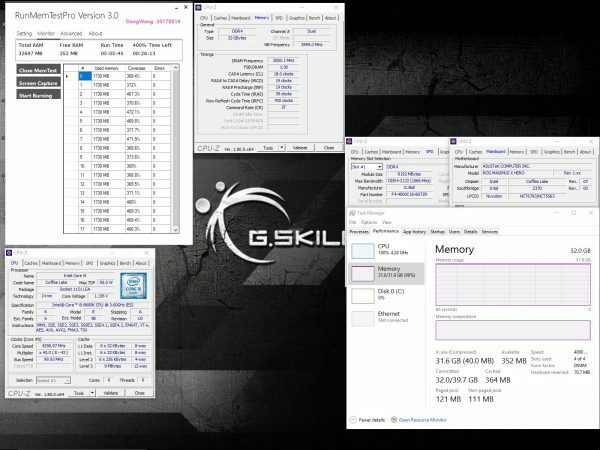 Below is a screenshot of the memory kit running on an ASUS ROG Maximus X Formula motherboard and Intel® Core™ i5-8600K processor. These high end Trident Z and Trident Z RGB memory kits will be available via G.SKILL authorized distribution partners in November 2017.